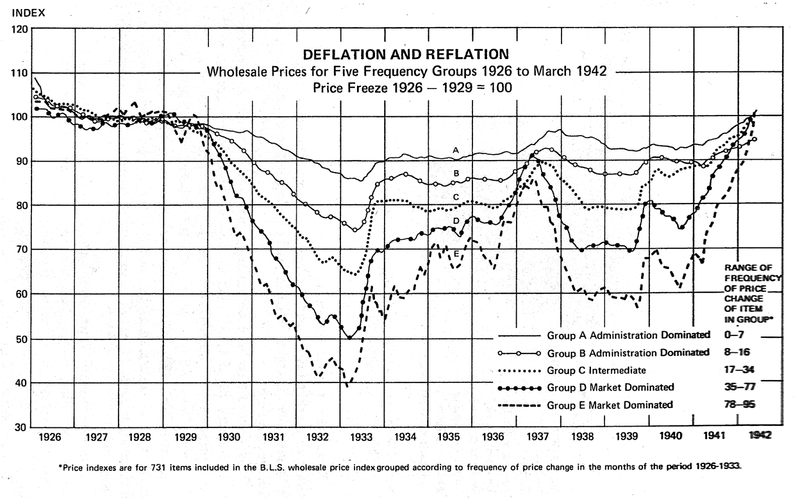 The US suffered from severe deflation in the contractionary phase of the Great Depression from 1929 to 1933, yet that deflation was highly uneven once the price data is disaggregated. Gardiner Means (1975) examined that data and concluded that even in the 1930s administered prices/mark-up prices were already widespread and economically significant. Means looked at five price indices for wholesale prices, and found that even here there was a huge disparity between administered prices and flexprices. The following table shows Means’ data in graph form (and needs to be opened in a new window to be read properly). As we can see, Group A (mostly manufactured goods) and Group B are administered price goods; Group C is an intermediate type of good that also includes administered prices but where flexprice commodities form an important component of the factor costs, so that the price reflects costs to a greater degree than other administered prices (Means 1975: 7). Group D and Group E are market-dominated flexprices. As we can see, by 1933 market-dominated flexprices (Groups D and E) had fallen by about 50% to 60%. By contrast, the most inflexible type of administered prices (Group A) had fallen by about 14%. Even the Group B administered prices had only fallen by about 25%. In administered price markets, the firms responded by cutting production and firing workers but maintaining their prices or only lowering them to a much lesser degree than in flexprice markets. Even the lesser price declines in administered price markets mostly reflected lower costs, rather than attempts to cut prices to clear markets. This graph also demonstrates the thinking behind many New Deal programs that attempted to raise prices: these programs were designed to reflate flexprices to fix the terrible disparity that had arisen between the incomes of businesses and farmers whose product prices had collapsed by 50–60%, as compared with the administered price markets. Although some of the methods by which the New Dealers did this were rather stupid and unnecessary, such as the Agricultural Adjustment Administration’s (AAA) payments to farmers to destroy crops and animals to raise prices, the general aim of reflating flexprices was not stupid, but defensible. 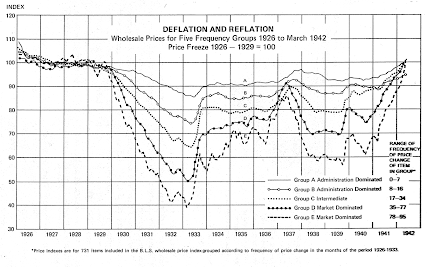 The reflation had largely succeeded by 1937, when Roosevelt turned to austerity and induced a further recession from 1937–1938 in which another severe disparity between wholesale product price groups emerged again. As Means noted, the inflation in flexprices during recoveries from recessions in any economy where administered prices are widespread is essentially a “natural part of the recovery process” (Means 1975: 10) and restores the price balance of an economy (Means 1975: 11). Curiously, in post-WWII recessions, the downwards rigidity of administered prices in the capitalist world has become even more pronounced: often administered prices stay the same or continue to rise even in recessions (Means 1975: 10). Means, Gardiner C. 1975. “Simultaneous Inflation and Unemployment: A Challenge to Theory and Policy,” in Gardiner C. Means et al., The Roots of Inflation: The International Crisis. Wilton House Publications, London. 1–31. Means' chart indicates that there is a spectrum from pure flexprice to pure fixprice that all business fall somewhere on, rather than a strict division between fixprice and flexprice. I'm not confident you properly understand what a "fixprice" is. It is not a price that never changes, but a mark-up/administered price based on costs of production plus the profit mark-up that is, generally speaking, not responsive to demand. Despite what you say, I think there is a useful distinction to be drawn between (1) flexible market based prices and (2) mark-up prices. Given that the chart I refereed to in my comment actually categorizes goods based on the number of times their price changes in a given time period it would be kind of weird if I thought that "fixprice" meant a price that never changed , wouldn't it ? What this fixprice/flexprice thing boils down to is the extent to which firms, faced with a fall in demand at current prices, will make quantity rather than price adjustments. This does not really seem to differ than much form the mainstream concept of "price stickiness". "This does not really seem to differ than much form the mainstream concept of "price stickiness"." First, the main mainstream explanations of price stickiness -- such as menu costs, information-gathering costs etc. -- have very little empirical support: the mainstream does not properly understand the major causes of price rigidity. Secondly, the mainstream believes in long run price flexibility: a concept for which there is no serious empirical evidence either, and which is like a religious superstition. "the mainstream believes in long run price flexibility"
Even the most inflexible prices are defined by Means as changing up to 7 times a time-period, and the chart has the line for these goods showing a price drop of 10% between 1930 and 1933. How is this not long-run flexibility ? That is, all markets clear at least in the long run. That is precisely what does not happen even in the long run when most prices are mark-up prices and not even very responsive to demand. Yet again you show us that you do not really understand the basic concepts being discussed here. When I look at that chart here is what i see happening. AD is falling sharply between 1929 and 1933. All prices fall, but as some prices are more sticky than others the rate of fall is very uneven. Then in 1933 the New Deal happens , AD is given a significant boost and all prices reverse direction. My view is that at some point (after a significant degree of probably unnecessary liquidation) the Pigou effect would have kicked in , AD would eventually have re-stabilize and (in real terms) increased to non-recession levels , and this would be reflected in relative prices which would approximate to an equilibrium. (1) first, do you concede that you did not understand the meaning of long-run price flexibility? (2) "Are you saying that absent the New Deal prices would just have gone on falling along the trend lines up to 1933 for ever "
That comment is incoherent. How could prices fall *forever* in a finite time period (up to 1933). (3) Post Keynesian economics does not say that market economies cannot generate recoveries. Of course some sort of recovery -- however weak -- absent government intervention was possible. What PK economics says is that there is no theoretical or empirical reason to think that market economies converge to full employment after shocks. On (1) : Well, I see that you define price flexibility in such a way that that the everyday sense of "prices that change" is dis-allowed and replaced with a stronger definition of "not just changing, but converging in the long run to a market clearing rate". I see also that you don't think that some prices meet that second definition. That's fine. I concede I didn't understand your definitions. On (2): I think you're misreading - I'm asking if you think the trend line would have continued beyond 1933 (and forever) on the same trajectory as before 1933.
on (3): How is such a recovery going to be generated if prices aren't to some degree capable of being driven by market forces to realign to their correct relative values ? This is close to what I would assume is meant by saying that prices adjust "to their market clearing values in the long run"
(1) "long-run price flexibility means that prices adjust to their market clearing values in the long run." That is not *my* idiosyncratic definition. This is how the concept is defined in neoclassical theory. You'd know this if you weren't ignorant. (2) "I'm asking if you think the trend line would have continued beyond 1933 (and forever) on the same trajectory as before 1933." (3) First, nobody said flexprices do not exist and, secondly, a very great deal of production is driven by demand signals, not price signals. How do you get a recovery in the absence of universal price and wage flexibility? Holy bejesus, even you should know how Keynesians answer this. If you increase AD, you increase production and employment. Out of genuine curiosity, I will not reply to anything, but I will just accept your answer as it stands. You say "and restores the price balance of an economy." How is it empirically determined when the price balance is restored and it has settled at this balance? How is it known, empirically, that the price balance ought to be at this place you deem correct? When producers of flexprice goods are not all or often driven into bankruptcy because of the price disparity between their incomes and mark-up prices. Also, nobody is saying it must be some specific set of prices. There may well be a range of options.